The Wholesome Table offers organic and healthy dishes in its menu. Even so, it does not compromise on taste, ensuring that each serving of food is bursting with flavors. Because of our busy schedules and also for practicality's sake, gone are the days when we would just dine out on a whim. We do, however, still love to treat ourselves to occasional indulgences. Every once in a while, we would pamper ourselves with unhurried dinners; taking our time to savor our food and enjoy leisurely bites. One restaurant that we kept a constant eye on is The Wholesome Table, located at Salcedo Village. 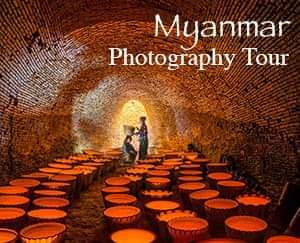 We knew it was quite pricey that was why we were hesitant to go. But one evening after a growling downpour, without any plan or whatsoever, we gave in and decided to pay The Wholesome Table a visit. We made our way through the dark Salcedo street, got lost, and for a moment, felt that we wouldn't make it. But after a brief consultation with Waze, we finally found the elusive place. The restaurant is enclosed in a small space, giving it an air of exclusivity while still remaining very inviting. The walls are almost spartan, save for some paintings and decors. It was homey, comfortable and somehow familiar. The restaurant was named as such because it specializes in serving organic food, supposedly healthier than regular produce that is raised or cultivated with chemicals. Part of the never-ending quest for health and wellness seems to be to go organic. It may not be the panacea for physical illnesses but at least consuming organic food somehow lessens the guilt of indulging in rich and savory dishes. At The Wholesome Table, once the menu is handed, the servers would immediately give recommendations on drinks, appetizers and mains. The drinks are combinations of all-healthy stuff. While the names might sound like concoctions from a science experiment, the drinks actually taste nice. 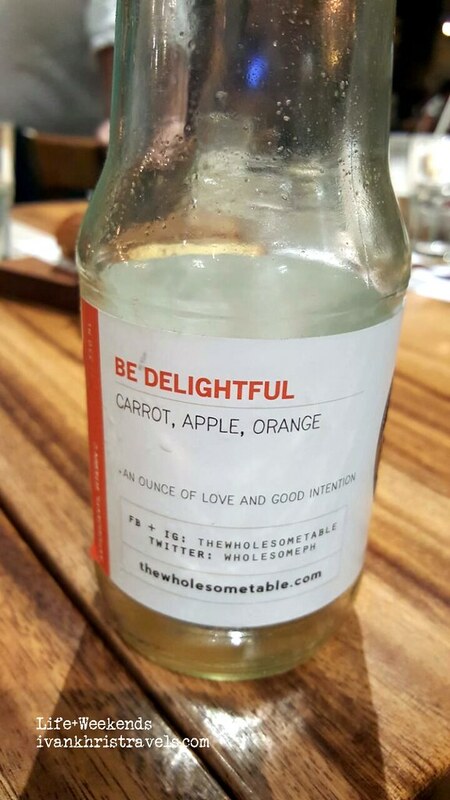 We had the “Be Delightful’ drink, a combination of carrot, apple and orange for a good dose of antioxidants. 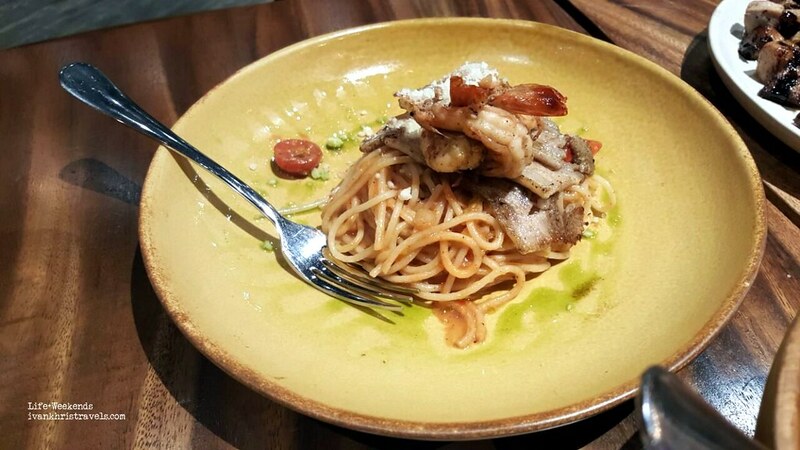 For the mains, there's a good selection of pastas, meats and seafood. We ordered chicken salad for appetizers. It had generous chunks of chicken on a bed of crisp mixed greens. 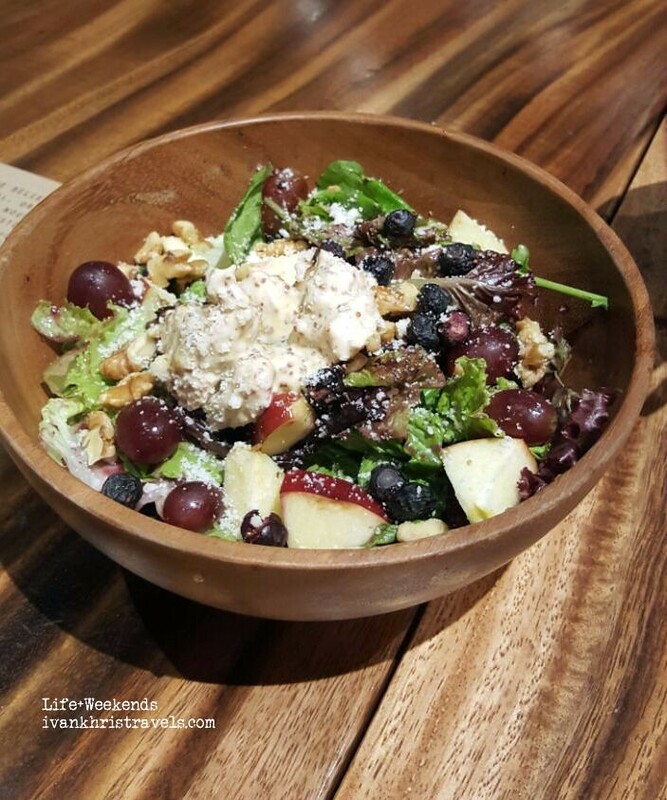 It has the goodness of freeze-dried blueberries, apples, walnuts, celery, Parmesan cheese and blueberry vinaigrette. It was well-dressed and definitely whets the appetite. The Gambaretti Arrabiatta is also a winner. It's got a good helping of shrimps, bacon with red tomato sauce and topped with generous helping of Parmesan cheese. It had a perfect balance of acidity, fresh seafood flavor and saltiness. 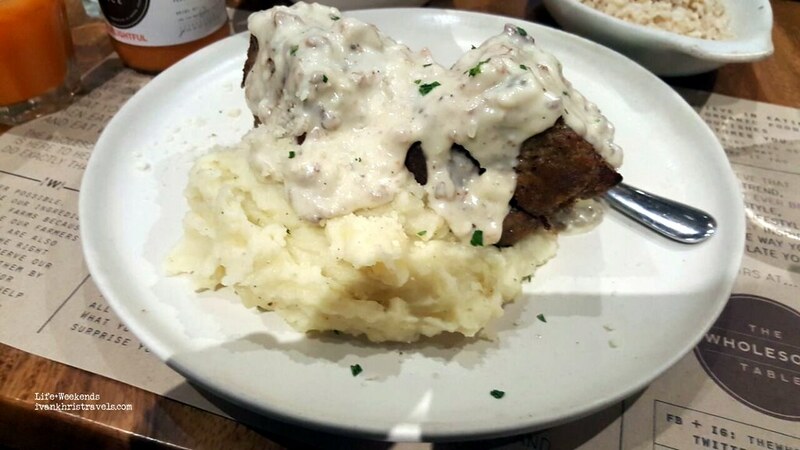 For the mains, we ordered meat loaf -- two thick slices of rich meat over mashed potatoes smothered with a rich and creamy bacon mushroom gravy. It was good and very comforting. The mashed potatoes was also flavorful but I had to have my meat loaf with rice -- take note, brown rice -- so it was obviously a heavy meal. 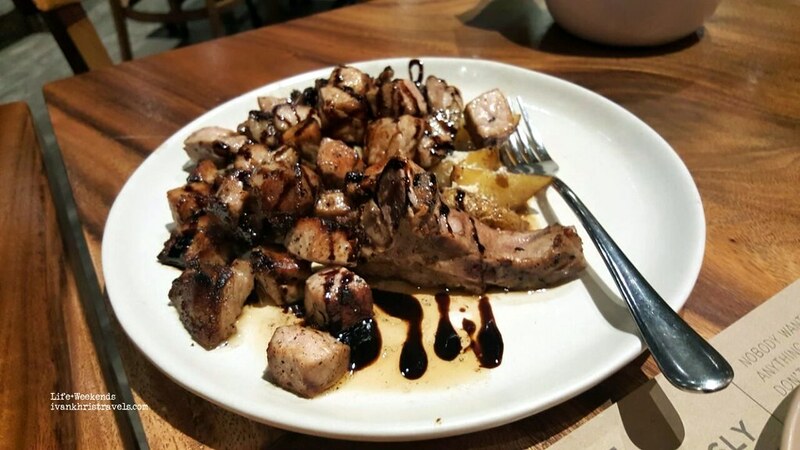 But the one dish that we had our eyes on was the pork chops. We ordered 2 thick slabs of meat and had it sliced into chunks. It was served with slices of what seemed to be roasted potatoes. It was every meat lover's delight -- perfectly tender, seasoned well and with a nice pink core. If there was one dish that we would always go back to at the Wholesome Table, it was this. The Wholesome Table does not pretend to be a pocket-friendly restaurant. The food here has "expensive" generously sprinkled all over it. But while the price of the food may not be justifiable to some diners, I believe it’s better to let the quality of the food speak for the restaurant. The Wholesome Table is for those who are looking for a place to enjoy excellent and healthy food in a quiet and relaxing setting. For our fairly simple meal of salad, pasta and meats, we paid Php2,210++. It’s definitely worth an occasional visit for those who would like to have a dose of healthy organic food, not just to fill the belly but to nourish the body.